Budget pressures targeting aid commitments that are already low by international standards. This year the Australian government will have cut more than A$11 billion ($9 billion) in aid, and by 2017-2018 aid commitments will have dropped from their current 32 cents for every A$100 of income to 21 cents. Australia is now considered one of the least generous official givers of aid of all wealthy nations, ranking 20th of the 28 richest nations worldwide, down from 10th some years ago. In a terrible week for Australia – first a hostage siege in Sydney and then the stabbing deaths of eight children in Queensland – Treasurer Joe Hockey still couldn’t avoid being dragged over the coals for his release of the MYEFO, the Mid-Year Economic and Financial Outlook. It already looked bad: the price of iron ore dropping steadily has ripped a large hole in budget predictions. However the deficit has expanded to a point not many expected: some A$10 billion. As a result one of the first things to have been “slashed” has been Australia’s foreign aid budget, reduced by another A$3.7 billion after an earlier cut of A$7.6 billion in May. This is also to offset the A$630 million to be spent on new national security measures the expected A$500 million to fight the Islamic State, or as the Australian government prefers, the “ISIL Death Cult.” These cuts do not have to be passed through the Senate, which has been hostile to parts of the budget, blocked education reform, and is being blamed now by the government for forcing it into these deep cuts, when Labor isn’t still being used as scapegoat. “We don’t like having to do this on foreign aid, but we have offset all of our new spending,’’ said Mr Hockey. “So, if Labor helped, we would see a whole different story and we would be able to provide more support for this and other programs. Understandably, those in the industry are unhappy, with the head of World Vision Tim Costello (brother of Peter, treasurer during the Howard government) calling it “immoral” and suggesting that the government is out of step with the people on this issue. However some polls suggest that Aussies remain skeptical on foreign aid, such that even Greens voters may be in favor of pruning it, should something have to go. Partly this is more to do with worry, or even cynicism, on where the money goes than a genuine disinterest in relieving the burdens of poverty on the world’s more vulnerable. A Lowy poll suggests that 75 percent of Australians see aid in terms of altruistic terms: It should be used to help the poor rather than as a tool of foreign policy to further Australian goals, or, to borrow from Colin Powell, a “force multiplier.” Costello’s suggestion then that Australia’s pulling out of aid in the region will weaken it and likely cause later problems for the area and thus Australia is an interesting one sitting somewhere between morality and a kind of liberal-esque realpolitik. When aid is down so far, any argument or appeal must do. So Is Australia Cutting Its Aid Budget Again? 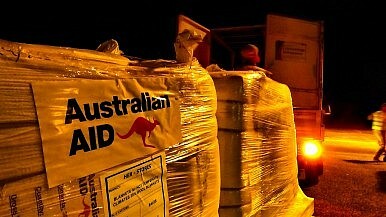 It appears Australia’s aid budget will remain as it is, or at least no more “slashed” than it already is.